In our article The Secret Book of Dzyan, we explained that there is increasing evidence and reason for accepting the “Book of Dzyan” – stanzas from which form the basis of the two volumes of H.P. Blavatsky’s main work “The Secret Doctrine” – as a genuine and authentic esoteric text, even if its current location and whereabouts is untraceable. There is even further evidence and reason that her subsequent book “The Voice of the Silence” should be accepted as legitimately coming from an actual and existing esoteric Buddhist scripture known as “The Book of the Golden Precepts,” just as she stated. The quote given above would be sufficient for many but there is still more that can be given. She states that the knowledge of the contents of all of those treatises “is obligatory” in the Trans-Himalayan Esoteric School, to which she and the Masters most closely connected with the Theosophical Movement belong. It is a beautifully written and inspiring outline of the Bodhisattva Path or “Heart Doctrine,” which has been described in the article The Two Paths. It is essentially a handbook, textbook, and guidebook, for treading the true Path of initiation and enlightenment, which, as it makes abundantly and poetically clear, is by no means easy. The real Esoteric Path involves the perfect and equally balanced combination of “head” and “heart,” knowledge and compassion, both of which are of little value by themselves. It is truly odd that with all the evidence and endorsements of authenticity, many – even some so-called “Theosophists” – would still rather suspect and believe plagiarism and fraud on the part of HPB than accept or even just seriously consider that she was a truthful, decent, honest, sincere person, labouring for the good of humanity. There is a term for such an attitude: closed-minded arrogant bigotry. It has been found that an original Tibetan text of the Book of the Golden Precepts was seen and studied at the Buddhist monastery of Thongsa Gompa in Kalimpong, Northern India, around 1950. As it happens, Lama Tinley did not himself belong to Thongsa Gompa but had his home in Bhutan and returned there some time later, taking his Tibetan “Book of the Golden Precepts” with him. What became of it and how he had come to acquire it in the first place currently remains unknown. What makes all of this even more interesting is that most of the teachings in “The Voice of the Silence” are different and foreign from what the majority of Buddhists believe and teach. Its Esoteric Buddhism is not at all the same as what Tibetan Buddhists mean when they speak of “Esoteric Buddhism” since they generally mean by this term the Vajrayana or Tantric system. 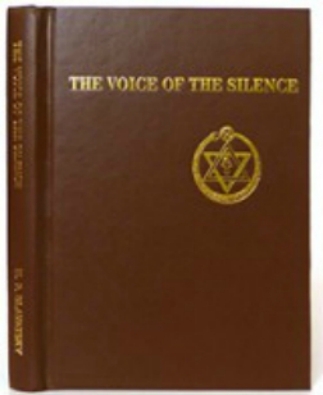 As its Preface quite clearly indicates, the Book of the Golden Precepts belongs to the Esoteric Yogacharya School, just like the Book of Dzyan (see The Secret Book of Dzyan, end of article) and it is this Esoteric Yogacharya School of pure Buddhism – the occult school and fraternity founded by the original Aryasangha, disciple and Arhat of Gautama Buddha – which is the Trans-Himalayan Esoteric School. For more on this connection, please take a look at the articles Self and Non-Self in Buddhism and Theosophy and Alaya – The Universal Soul. In closing, we ought to add that the small book “Light on the Path,” written by Mabel Collins under the inspiration and direction of the Master Hilarion, is also derived from The Book of the Golden Precepts. There are a number of similarities and subtle correspondences between “Light on the Path” and “The Voice of the Silence” and the former, which was published first, includes the term “The Voice of the Silence” several times. Visit the Books on Theosophy page for information about how to obtain the original Theosophical books and literature, kept in print today by the United Lodge of Theosophists. Beautifully rendered article. As a student of original Theosophy for over 40 years, and having studied with as much discrimination at my disposal, the works of Psong kha pa, Shantideva and Nagarjuna (mostly through renderings of Jeffery Hopkins, as well as the Mahayana Uttantra shastra-reccomended on this site), it seems to me as if only The Voice of the Silence shows the heart of them all. Only HPB presents to students the keys to these great texts in such a way as to bring out the best in one. My intention in my study of great Tibetan thought was to see if I might flesh out in greater detail, the basis of Psong kha pa’s perspective and find more understanding for HPB teaching that he was the 1st impulsive of the seven. I think HPB does this, as I see it in The Voice, although finding this out for myself, in finding a way through the rather dense texts previously mentioned, makes what one has learned more indelible and The Voice more appreciated. If i’d had to choose only one book to keep then it would be the voice of silence.